The Korean version of the Chosun Ilbo has published a May 25 article entitled “Danger of Dokdo Disappearing from Wikipedia,” which is warning Korean netizens that there is an online vote being taken at Wikipedia to decide if the online encyclopedia should use “Liancourt Rocks,” “Takeshima,” or “Dokdo” to describe the rocky islets between Japan and Korea. Currently, the online encyclopedia automatically directs you to the “Dokdo” page if you type in either “Liancourt Rocks” or “Takeshima.” The Chosun article seems to be calling Korean netizens to arms. 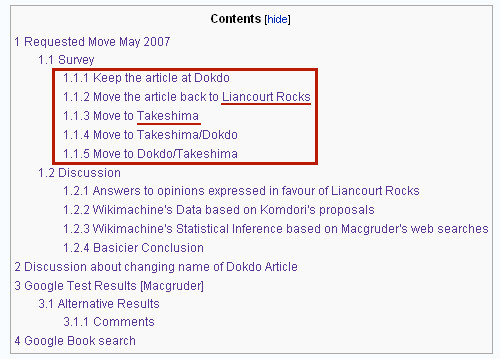 Beginning on the 21st (negotiated world time), voting began and is continuing on Wikipedia to decide whether to continue to use the current name of “Dokdo” or to change it to “Liancourt Rocks.” Currently, if you type in “Takeshima” or “Liancourt Rocks,” you are automatically transferred to Dokdo. Normally voting lasts for five days, but it is unclear how long this vote will continue. However, if the voting stops now, it looks like the official name for Dokdo will be changed to “Liancourt Rocks.” When it looked like the Japanese name, “Takeshima,” would be not reflected internationally, most of the Japanese started advocating the use of “Liancourt Rocks” as the official name to dilute Korea’ s title to Dokdo. Wikipedia is a a public-project encyclopedia, in which people from all over the world Wikipedia participate and write and edit as they wish. If someone makes a new item or corrects an item, people from all over the world rush in to verify it and and make further refinements. However, when it involves disputes, such as the name for Dokdo, people are not free to edit and correct, and a netizen vote is used to decide to make changes. You can vote after going to Wikipedia’s Web site at(http://en.wikipedia.org/wiki/Talk:Dokdo) and logging in. I found the record concerning Usando in 1735. The investigation by 張漢相 at the 17th end of the century is being written. The Chosun government made 張漢相 investigate Ullengdo, and he saw the figure of Ullengdo. After that, Ullendgo has been heard a vast and fertile island. There are signs in the dwelling and traffic, too. In the west(of Ullengdo), there is Usando. It is said that this island is wide and fertile, too. West? That makes what? Neither islands which described as “東方五里許 有一小島 不甚高大 海長竹叢生於一面” or “東望海中有一島 杳在辰方 而其大未満蔚島三分之一 不過三百余里” in “鬱陵島事蹟” by 張漢相 in 1694 were 于山島? Well, it only proves Choson officials in 1735 didn’t really know anthing about even 于山島 or Chukdo, not to mention Takeshima(Liancourt Rocks). By the way, are you involved in the voting? Anyone let me know how to post the suggertion on Wikipedia,I had created the accounrts, but it seems to be locked/protected,and I don’t know who is Level―4User who can have right to unlock/unprotect. And I would never trust Wikipedia on anything written about Chinese communists. Now, those Chinese and Koreans are fighting on the controversy of Goguryeo. I agree. There are huge collections of political articles on Wikipedia which have never been reviewed by stable heads. I would not trust Wikipedia’s stance on any Korean article. Rather, we should compile good articles like the one on this website. I think so. One Korean thought that Usando is in the west of Ullengdo because old Korean maps described so. Other Korean thougt that Usando is chukdo because 張漢相 reported a small island. The article cannot be retouched directly. First of all, it is necessary to propose the retouching matter on the page of discussion. After all, it is likely to become useless about time because it becomes an edit battle with pro-Korean. I doubt that this issue will be big. All due respect, sir, but it’s hard to claim equivalence when the Korean sockpuppets outnumber the Japanese (mostly 2chan) trolls dozens to one. The Vanktroopers will probabl be disappointed with the conclusion. They failed with the lame “East Sea” ploy, and the Wikipedia admins’ patience is wearing very thin with Korean netizens. The Koreans chicken out because they know the Chinese argument that history is not exclusive is far more superior to their Korean racist ethnocentrism. Apparently the concept of a multiethnic and multicultural country is difficult for the mind of some Koreans and Japanese to understand.